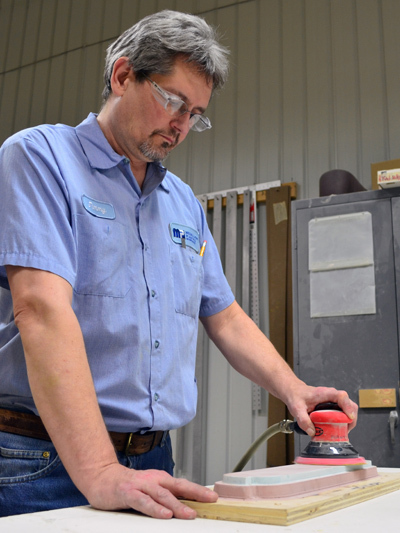 Almost all of Medallion's prototyping and production tooling is made in-house at our Mold and Tool Facility. Using advanced equipment such as one of our industries' largest twin-table five-axis CNC routers, we are able to mill custom patterns with very high dimensional accuracy. These high quality patterns are the "solid form" starting point for the creation of high quality production tooling. The raw material used to mill patterns is either hardwoods or a high density solid polyurethane. These materials are then cut and laminated into blocks. These laminated blocks will roughly correspond to the dimensions of what will become the finished pattern. After the patterns are milled, they are checked for dimensional correctness and surface quality and then hand prepped for prototype production. The resulting prototype samples are quality-checked again and then released for customer approval. 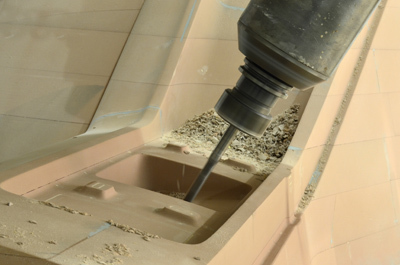 Once approved by the customer, the pattern is transferred to our tooling department where a production mold is built. Most production molds are manufactured using an extremely robust ceramic and fiberglass composite material and are guaranteed to last for the lifetime of the customer product. 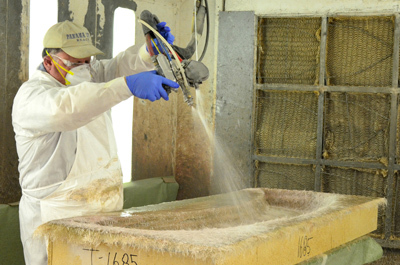 Milling the pattern from polyurethane foam.